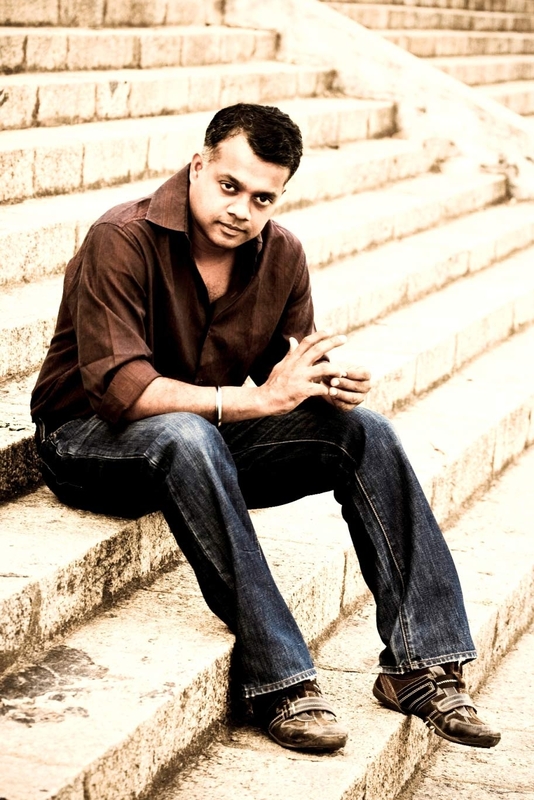 Gautham Vasudev Menon: On being the man you want to be (Uncut) | MADRAS INK. In an orthodox old-fashioned film industry that thrives on star-worship, one man has the spine to call a spade a spade. Gautham Vasudev Menon has to be the gutsiest of our filmmakers. He’s also the rare professional who is man enough to take criticism with all sincerity. Yes, man is the word because Vaarnam Aayiram is all about the essence of being the man you look up to, being the man who can sweep the girl off her feet with his strength, poise and courage. It’s an emotional personal film straight from the heart for Gautham considering it was born out of his father’s death. “Three days after he passed away, I decided I must do this film,” he says. Vaarnam Ayiram, he insists, is not an action film, it’s a coming-of-age drama where boy becomes man. “This is a very meaningful film. It’s high time I made something like that. Pachaikili had a climax for the hero. For Kamal Sir, we gave him a 20 minute intro which wasn’t there in the first script… Everywhere, I was toeing the line. This time, I thought let me make a film that deserves what it needs and nothing more. So I was thankful for someone like Suriya who straightaway said Yes, I love it. This is perfect. I relate to the story. Any influences in making the film? This is his most realistic film till date. Did he make Suriya starve for the six-pack? Being a successful filmmaker, he has to deal with escalating expectations and uncontrollable hype. I was misquoted. This journalist asked me why I work only with Suriya. So I said that’s not true, I narrated a story to Vijay. He loved it. He laughed as I was narrating it and he said: You know what Gautham, can you put stuff like what I do in the film? Have you seen my films, he asked and gave me a few DVDs for reference? I had seen those Perarasu’s films. So I immediately I said ‘Vijay, that wont work in the film I narrated because this was meant to be a refreshing love story’. There would’ve been a sensibility disconnect. So I told the journalist I was disappointed when I got home but he went on name Perarasu’s films and made it sound like I was degrading Perarasu’s films, which I was not. I tried to call Vijay to explain but he didn’t see the bigger picture. So sometimes, it is better to keep quiet. Read the last interview I did with Gautham before Vettaiaadu Vilayaadu here. Sudhish,I’m interested in what you think about the line where he says that “Nobody is capable of performing like Surya”. so varanam aayiram is not an action story? ppl willl come in with an expectation of a sequel of kaakha kaakha. when they expect a film like KK, if autograph look alike film starts,i am not sure how they’ll take it. High risk,Gowtham!But if the movie still refreshes and make ppl feel good,then you should be happy.. If Gautham seems to read this,I want him or atleast SK to reply to this.Does the director really approves of his music director lifting songs? I have always loved Goutham’s movies from “Khaaka Khaaka” … and I am really happy to see that he is a very talented director ! Nothing to say abt Surya … he is so perfect ! Congrats.You have done a good job in Vaaranam Aayiram.Iam sure your father will be very pleased. Vaaranam AAyiram is such a lovely movie. After a very very long time i have watched a wonderful movie. Surya is so perfect in the film and he has done an extraordinary work. Hats off to Surya for his acting and for Gowtham for this wonderful script. I came across this interview by accident and I am glad I discovered it. Loved the interview because GVM is one of those refreshing faces in Tamil cinema who is not afraid of speaking his mind and he gets bricks thrown at him for that. What Tamil films need is a wake-up call: people who will call a spade a spade. I was delighted to read his comments on Bheema because it was honest! Not many people have realise he also made a very good observation about Sivaji. Yes, it was a good entertainer but was it really necessary to spend that much of money for a movie with that message, he asked, which was very true. I liked the fact that you ask some “tough” questions. I find that most profiles on Tamil movie personalities in either the English or Tamil media is so wishy washy and rarely takes the reader into the mind and the personality of the celeb. And they are all so politically correct. The media in TN seems to revere the celebs especially if they are really big and bend over backwards for them and are rarely critical. I loved Vaaranam Ayiram and it was easily one of the best Indian films for 2008. Many of my non Indian friends for whom Indian films means Hindi films who watched it (because I was on a one woman campaign in KL to get as many people to watch it) were amazed that Tamil movies could be so good or that they had handsome heroes. My Malay friend is now a huge fan of Surya and has seen most of his movies (especially the ones with Jo) on DVD. GVM had said in one of his earlier interviews that he plans a triology of police movies. I am hoping he will make his third with Surya and Jo! Keep up the great work. And if you do know GVM personally, please tell him that he is one of the reasons why we who watch Tamil films can walk with our heads held high. Goutham’s body language is good. hi sir how are you?im love your film. Great interview. Loved the frankness with which Gautham speaks. Very very disappointed to hear about the ‘Vijay issue’ that Gautham had. I have always liked Vijay but once this episode happened, everything went downhill for him. Now he is left to cling onto Sun Pictures to call his films a superhit, megahit, etc through their channel (everyone knows Vettaikaran’s fate). Vijay can do a love story and a Gautham signature love story with great elan. I still have some hope that Vijay would realize that Gautham can give his career the boost needed, and will join with Gautham one day. I dont care abut his fans, VIJAY WAS WRONG IN THIS ISSUE! You have done a great job in “Vinnai thandi varuvaaya”…………………. I would like to assist you……. hi gautham this s selva from bangalore…… vtv was outstanding…… all tha very best for your “neethane en pon vasantham”…..
Gowtham sir,i would like to speak tamil..
Neenga direct panna vtv.padam ipatha sir pathen.ivlo naal enaku thonala intha padam pakanum nu.bt ipa thonuthu..naan enoda lifela arputhamana 3 hrs ah,ivlo naal miss paniruka.sir basicave enaku film industryla zero knoledge .so enala unga talent pathi pesa mudiyala.oru request…enkuda ore oru coffe….sir.only 3 mins.3 hrs la life pathi evlovo enaku solirukinga.oru 3 mins enakaga spend panunga sir…ithu kidacha pothum.ithu tha en vazhkaiyin athisayamana 3 mins.pls.